New Kitchens – Click here to visit our NEW Gallery! We will work with you to suit your needs and budget. All types of finishes are available for kitchen doors: Laminate, Poly, Vacuum-formed, Solid timber etc. NaturaStone is a 6mm thick Australian made quartz surfacing material combining beauty with ease of handling and exceptional durability. 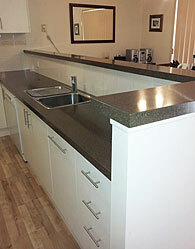 NaturaStone can be installed as acomplete new benchtop or easily applied on site, resurfacing existing benchtops and substrates. 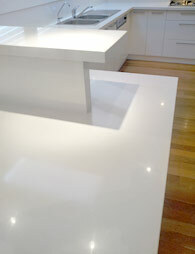 NaturaStone is an Australian made quartz surfacing material manufactured from a unique formulation combining over 90% natural quartz and the resilience of a high performance acrylic polymer. This propriety formulation and processing technique produces extruded stone slabs of premium quality. The slabs contain a multi filament reinforcement mesh encapsulated within the slab, resulting in a solid non-porous one piece material providingexceptional scratch, stain, heat andimpact resistance. NaturaStone slabs are diamond polished to a lustrous gloss finish and are supplied in a nominal size of 3050 x 1300 x 6mm. This convenient size provides easy of handling during fabrication and installation. Although having a high hardness level of over 7.5 MOHS (diamond being 10 MOHS), NaturaStone is a flexible product resisting chipping and cracking. In fact, NaturaStone 6mm slab are more resilient than 20mm thick slab. The NaturaStone manufacturing process and materials are designed to be more environmentally friendly than other engineered stone materials. In addition, NaturaStone slabs utilise less material whilst achieving a superior result. Available through a network of accredited installers, NaturaStone is backed by a 12 year warranty, where NaturaStone Pty Ltd warrants the NaturaStone material is free from defects for a period of 12 years from the date of purchase. Please refer to the NaturaStone website for a copy of the warranty.